Python Turtle write function output text on the turtle window. This package covers the write function, string and numeric output, arithmetic operators, as well as integer and float data types within the turtle module. Everything is included: 3 versions of the student handout package, five PowerPoint lessons, answer keys, and 3 versions of the two assessments. 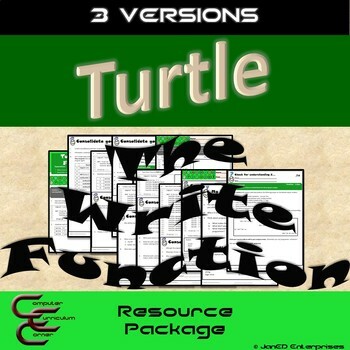 Turtle 2B The Write Function with For Loops 3 Version Resource Package is the next step in this series. ☞ Perfect for classrooms where the seating is tight. 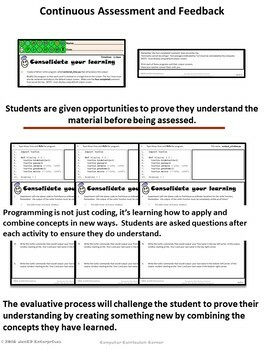 ☞ Students see multiple examples of the same concept. ☞ Differentiated instruction is built into every assessment. ☞ Encourages student interaction & discussion. Concepts and skills have been broken down into short chunks. Students are given short code fragments to explore, followed by questions to consolidate their learning. They are also asked to reflect on their learning and provided terminology to begin/continue a programming dictionary. Materials have also been modified in English (UK) where necessary. Duration: Four 75 minute periods. This package requires NO PREP! The student handouts will require photocopying but that is all! 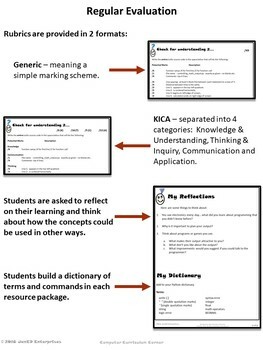 KICA This item has an alternate marking scheme which has been broken down into 4 categories: Knowledge, Thinking/Inquiry, Communication and Application. ✯Leave feedback!✯ Rate this resource to receive TpT CREDITS on future resources. Thank you for visiting my store. Please rate this resource. If you ever have any questions, concerns, suggestions or requests please email me at: ccubed.me@gmail.com. Watch out for my computer programming courses and other free computer related resources. Don’t forget to follow me for exciting new product announcements, sales, promotions and updates! All Computer Curriculum Corner materials are the property of JanED Enterprises. As such they may not be resold, shared or distributed either in paper format, online or electronically to anyone. Purchase of the product is for limited SINGLE classroom use by the purchaser only and it may not be shared with multiple users, including but not limited to teachers of the same course or grade level. Nor is it transferable. It is a violation for individuals, schools, school boards, or districts to redistribute, edit, sell, or post these items in any form on the Internet, network or shared drives, classroom/personal websites or to other individuals. No part of this publication may be reproduced, modified, distributed or transmitted without the express permission of the author. Disregarding the copyright is a violation of the Digital Millennium Copyright Act and subject to legal action. 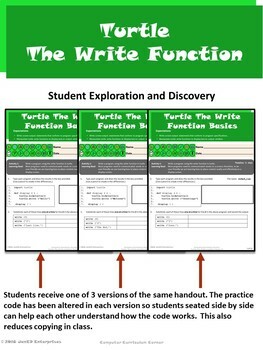 Turtle 2A The Write Function Basics 3 Version Resource Package by Janice Dyke is licensed under a Creative Commons Attribution-NonCommercial-NoDerivatives 4.0 International License.